I really enjoyed it I thought it was very funny. I liked the crow he was very amusing when he said "give us a biscuit". The history was very good and very realistic it felt like it was wrote as the author was there. It made me want to learn more about chariots and Roman soldiers and has inspired me to look at more books written by this author. I really enjoyed this book because it is really funny and adventurous it makes you want read more and more. I thought that Tiddles the elephant was really cool and was extremely funny. The main character was Croakbag who told the story but was also in it. Croakbag was very clever and also told us a few things to impress your parents. I don't think this book set out to be realistic but it did make me want to read more about the Romans. I wouldn’t have chosen Jeremy Strong but this book has definitely made me think different about this author. I think this book is a really good read aimed at 6 - 10 year olds. The book is about a bird called Croakbag and he is telling you a story about a boy called Perilus and Scorcha who go charioting. What I liked about the story was that it was very funny and interesting because of Croakbag and Perilus who were really funny. My favourite part was when they were racing in the chariots because one of the got kidnapped by two other people. I would recommend this book to 8-10 year olds because younger may not understand some of the language in it. I learnt what Rome use to be like when I wasn’t born. Give this book a rating out of 5. I am reviewing Romans on the Rampage. This book is long and packed full of humour. This book is about a boy’s family being locked in jail for no reason, the boy brakes them out but is observed by a crow the narrator and main character. The boy’s dad has been accused of stealing ten thousand denarii AND his daughter has to be married to fat bank owner Fibbicus Biggicus, who is ugly. His daughter sobs at the thought of him for her true love is Sorcha, a chariot racer. But Fibbicus Biggicus has actually stolen 10,000 denarii and a criminal cannot marry so in the end she can marry Sorcha! This book is a great read and is really worth reading. My favourite character is the crow who is full of humour my favourite part is when Tiddles the elephant broke a prison wall. I chose this book because it’s funny and I’ve learnt some Latin. There’s a raven called croakbag and my favourite part is where the raven tells jokes. The funniest part of the book was when the elephant (Tiddles) broke into a prison, and used water to squirt the guards, to save Waddya’s family. Maddashbananus made the skateboard and the people who race in races use skateboards. I haven’t read it all of it yet, so I hope I enjoy the rest of the book. This is an excellent book for people who like comedy. It also teaches you quite a few Latin words along the way. Moreover I really like how the author turned words like ridiculous and perilous into the characters’ names (Ridiculus and Perilus). My favourite characters are definitely Croakbag, the crow, and Scorcha, a famous charioteer. It really made me want to find out more about romans. I would definitely recommend this book to any 7-11 year old. Jeremy Strong’s is good book for 11 and over because it has quite hard words in and you’ve got to keep up with the story because it adds on lots of information like words in Latin. I personally didn’t like the book but other people might. This book is a book that could help people learn a different language (bits of it). I don’t think this tells you a lot about history. It just says Latin words and about a chariot race. I don’t think it is very historical but some people might like reading it because they think it is fun. 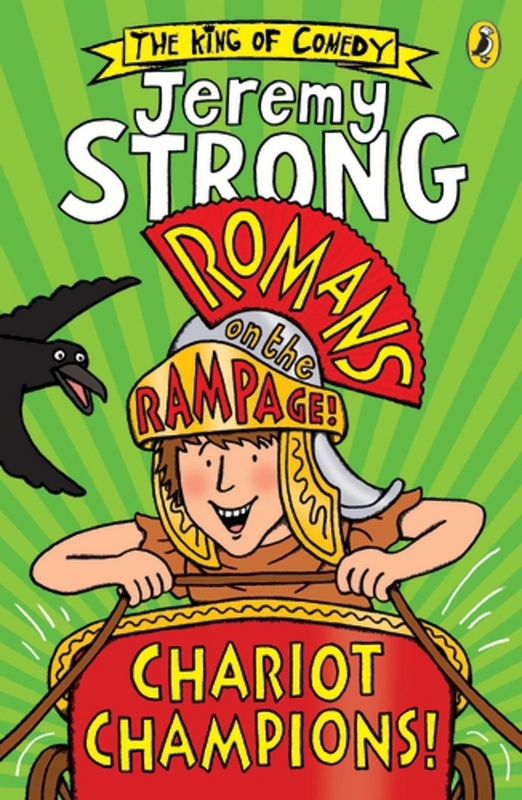 I think ‘Romans on the Rampage: Chariot Champions’ is an amazing book with funny parts in all the pages! My favourite character in his book is Croakbag because is always very funny, he loves saying he is the ‘cleverest raven in the world’, he really likes biscuits and he teaches you Latin every now and then through the book. You will love him! This book was specifically related to history because of all the events which happened when the Romans arrived, happened in this book. For example, the book explained about chariot racing, how the machines we use now were made and how different our lives are from when the Romans lived. This book did make me want to learn more about this period of history because of the chariot racing. This sport interest me a lot and after you read the book I bet you will be interested too! I love Jeremy Strong’s books because of how funny they all are and after reading this book I don’t know how I am going to stop getting more of his books. I hope you feel the same. You will learn a lot from this book, Latin, new words and much, much more! This book is about a Roman family who is thought to have stolen money from the Imperial Mint. Croakbag, the raven tries to figure out who stole the money and why they do it. He can’t just ask everyone in Rome, “Have you stolen any money from the imperial mint?”! This book is full of laughter and adventure. You will meet both criminals and heroes. My favourite character is Croakbag because he is proud and funny. He calls himself Corvus Supremus, Corvus Brania and Corvus Smartia Pantius. I think Jeremy Strong has lived up to his fame as the King of Comedy! I love this book because it makes you laugh and at the same time makes you wonder what is going to happen next. My favourite bit is when Maddasbanaus uses his fire engine to save the house because now, we use them so often but he would have invented and used one first. This book is extraordinary because it is funny and it makes you see what is happening in your mind. There is lots of fun and adventures to be had. I loved it. The emperor had announced the biggest chariot racing competition in the whole world but Perilus’ mum and dad are in jail and he has to get them out. My favourite part was when they first stared to break out of prison because every one gets scared of the ginormous elephant when it distracts everyone with its huge sneeze. When I learned the name of the book I was instantly attracted to the book. I would recommend to ages 7 and up/ and for someone who likes adventures. To begin with I thought the book was excellent and I couldn’t wait to read more of Jeremy Strong’s books. I really like the fact there is a funny side to the telling of the story as it is told through the eyes of a raven called Croakbag. I really liked the part when they are in the prison and it me think about prison life back in the Roman times. I am not sure how real some of the history is in the book but it is a fun book. Some of the Roman names are hard to read and so made it difficult to follow each character at times but I enjoyed the book, it was easy to read and funny at times. I enjoyed this book because I thought parts of it were funny. My favourite parts were where he enters a competition and wins and when his Mum and Dad make heart shaped pizza. I would like to read more books by this author because I thought it was a funny story. The book starts with a boy named perilous. He wants to take part in the most epic chariot race in all of Rome. But first, Croakbag , the smartest Raven in Rome, has to solve a mystery about who stole all the money from the bank. The robbery was planned by a man named Krysis & three other children, who successfully stole the money . But Croakbag tactically stopped them. I would recommend this book to a 7-12 year old. I enjoyed this book because it is very funny and is written from the perspective of the talking crow Smartimus Maximussus. The crow teaches you about the Romans’ family life, and even a little bit of Latin. Most importantly this book is very entertaining and could be an easy read for ages. I would recommend this book to anyone aged 7 to 11 and would rate it 8 out of 10. This was funny. It’s about a raven that solves crimes who can talk. I liked the Roman names like “Ridiculus” which sounds like he copied the idea from Harry Potter spells. The main bad guy is called “Fibbus Biggus”. There are lots of jokes and humour and simple pictures (but they are not by Nick Sharatt). It’s got pizzas in it which aren’t very historical. It reminds me of Steve Cole’s Astrosaurs books, there is lots of messing around and jokes mixed with the adventures. Chariot Champions is a quite short and funny book about a typical family in Ancient Rome. The story is narrated by a snarky and self-obsessed raven who describes the adventures of the family when the father is accused of fraud and arrested, as well as Hysteria and Scorcha (the ex-slave charioteer) and their love affair, as well as Perilus' dream to become a charioteer. Lots of the characters have amusing names - like Hysteria, who always cries, or Fibbus Biggus, the man who accuses the father of fraud. The anachronistic inventions of Maddusbananus the inventor are also funny. The story is generally historically accurate from what I know as well as teaching you lots of Latin, like 'salve' and 'vale', although sometimes accuracy is ignored in favour of more humour. Often the story goes off topic for more humour which can be a bit irritating when there are page long tangents. However, I generally liked the book and it was very funny. Yes I did like the book because the chariot race was fun but it's just too short. Yes there is a special event where the boy witch is the main character wins the race. The history is realistic but not all of it is because the Romans did chariot races but the boy wasn't real. It was based on facts, but there weren't many real facts as it was a story. Although I liked the book, it didn't make me want to read more by the same author as the actual chariot race was a disappointment. I thought there would be more about chariot races. The race was fun and full of excitement but short! It had funny parts where they saw an elephant. I would, however, recommend this book to others as everyone has different tastes. It is a story which is told through the eyes of a raven. He visits different places and meets different people like the emperor. It is set in the past in Roman timesÂ and it has some words from Roman times (Latin). The book is just right for year 4 children the words can be hard and some easier. My favourite part in the story was at the start when it told me about the boys dream to be a chariot racer. I would recommend this book definitely. I really enjoyed reading this book because it is full of humour and is different to other books I have read. Wherever I get up to in the book it always wants to make me read on. This book also helps me learn a bit of Latin. My favourite character in this book is Croakbag / raven. I like Croakbag because he is funny and never stops talking about biscuits, and also is very interactive with the audience in different parts of the story. I wonder, did Romans invent skateboards? I really enjoyed this book because I love reading about the Romans and it is very exciting and has a lot of drama. My favourite character is Cati; Cati is a little girl and the stepbrother of the main character Marcus and the daughter of Dragonix who is English. My favourite part was when Marcus was adopted by Dragonix and his family. I think the history in this book is really good. Even though it has some tricky words in the book, this book made me want to read more about the author Tony Bradman and his books. I really recommend this book to others and I rate it 5 stars.